One assumes biopics about noted intellectuals and philosophers aren't exactly the easiest thing to sell to studio execs, much less an audience. Even Albert Einstein tends to only get movies when it's either a romantic comedy or an imagined fantasy pairing him with Marilyn Monroe. So, hats off to German director Margarethe von Trotta (Rosenstrasse, The Lost Honor of Katharina Blum) for not only getting folks to back her movie about 20th-Century philosopher Hannah Arendt, but for also making it entertaining and provocative. Co-written by von Trotta and Pam Katz (Remembrance), Hannah Arendt stars Barbara Sukowa (Europa, Berlin Alexanderplatz) as the central character, a Jewish woman who fled from Germany during World War II. Arendt landed on her feet in America, where she began writing her many books exploring the relationship between individuals and the society in which they live, and how each is defined by the other (to be fairly simplistic about it, as my understanding of Arendt's actual writing is limited). She became a professor at the New School, and eventually became a naturalized citizen. von Trotta's portrait picks up in the early 1960s, just after the arrest of Nazi fugitive Adolf Eichmann, who was abducted and taken to Israel by Mossad in order to stand trial. Arendt decided she wanted to see what this notorious individual looked like up close, having herself been separate from much of the atrocities of Hitler's rule by getting away during the war. So, she proposed to The New Yorker that they send her to Jerusalem to cover the proceedings. 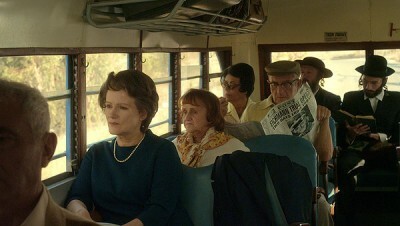 Once there, the movie tells us, Arendt was surprised to find that Eichmann was not some larger-than-life personality, but a mere bureaucrat whose very averageness suggested a more insidious cruelty than she even imagined. He embodied what she called the "banality of evil." His terrible activities organizing the transport of Nazi prisoners to their deaths at concentration camps were not undertaken for selfish gain, personal hate, or any other strong conviction. His adopting the standard Nazi defense of "I was just following orders" was indicative of the truth: he had surrendered all personality to "the law." He was all the more disgusting for having just done his job instead of exercising some kind of moral imperative. This became a central thesis of her articles and her eventual book, Eichmann in Jerusalem, though, as Hannah Arendt points out, the main controversy and criticism of the material was that, in looking at all the evidence presented, Arendt noted what she considered an error in judgment on the part of the Jewish leaders who cooperated with the Nazis. Their hope of lessening the damage by trying to go along, to her mind, only led to more deaths. In much the same way pundits tend to do today (and so it seems history repeats), seizing on and singling out such incendiary elements without acknowledging the totality of the work only proved to cause an uproar and derail any serious engagement with the topic by the populace at large. Hannah Arendt deals with the full story, from the visit to Israel through to the criticism and defense of the articles. It features lots of heated debate, flashbacks to Arendt's college affair with Heidegger (Klaus Pohl), a little bit of political intrigue, and lots of wrestling with notions of what's noble and correct--or as Arendt puts it, "right and wrong, beautiful and ugly." 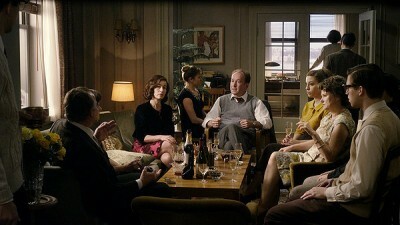 The film engages with the ideas in a meaningful way, avoiding creating any "Ah-ha!" moments like we tend to see in biography movies about singers or artists, while also remembering to treat Arendt as a human being. Essential to her intellectual pursuits is her stable home life. Arendt had a very loving marriage with her husband, Heinrich Blücher (Axel Milberg), the man she fled Germany with and her most ardent supporter. The turmoil over her choices cost Arendt many friends, but Blücher held strong. This mixture makes for an engaging example of how good biopics can be with a smart guiding force and a focused narrative. 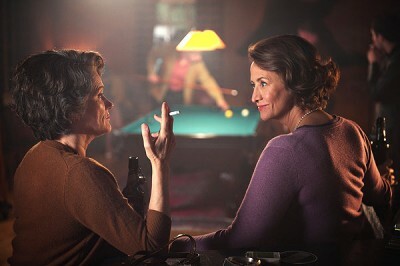 Hannah Arendt bites off exactly what its writer/director can chew, digesting the material in a way that is both illuminating and a pleasure to watch. Hannah Arendt comes to Blu-ray as a 1080p high-definition transfer, showing at a 2.40:1 aspect ratio. Colors are vividly realized, with nice blacks and no noticeable crushing. Contrast and detail are both strong, and resolution is sharp. The movie's soundtrack is dual-language, with characters speaking both English and German, presented as a 5.1 DTS-HD Master Audio track. The sound is strong, with good emphasis on the dialogue and well-balanced ambient effects. Subtitles for the German material are in English, with an option for full English subtitles for the deaf and hearing impaired also provided. The disc for Hannah Arendt comes in a standard BD case with a 20-page booklet featuring informative supplemental articles, including a detailed guide to the different real-life figures in the movie and historical timelines following the lives of Hannah Arendt and Eichmann, leading up to how their lives intersected. On-disc features include a 30-minute making-of that includes interviews with the director, co-writer, and producer, as well a section with deleted scenes showing a removed sequence. The theatrical trailer is also included. All features are in HD. 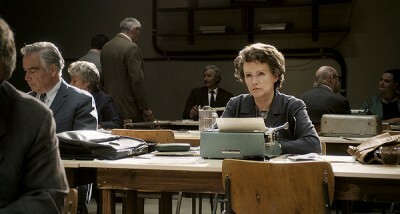 Hannah Arendt, Margarethe von Trotta's somewhat conventional biopic of an unconventional thinker, succeeds where the more typical and expected examples of the genre go wrong: it is direct and focused and showcases rather complex ideas in a way that is clear but otherwise doesn't trivialize their importance. Barbara Sukowa delivers an exceptional performance as the main subject, capturing the humanity of Arendt and all the things that entails. There is a sweet romantic subplot amongst all the high thinking and debates between smart and passionate people that reminds us that even eggheads have hearts. Yet, von Trotta isn't cloying about it, her portrayal of the personal side of things is just as matter-of-fact as the more public expressions. Highly Recommended.